Pix: Shaun Flannery/shaunflanneryphotography.com COPYRIGHT PICTURE>>SHAUN FLANNERY>01302-570814>>07778315553>> 19th April 2016 Finance Yorkshire - Jenx Ltd Wardsend Road, Sheffield, S6 1RQ L-R David Ward, Finance Yorkshire, Melanie Reynolds of Finance Yorkshire, Clive Jenkins of Jenx. 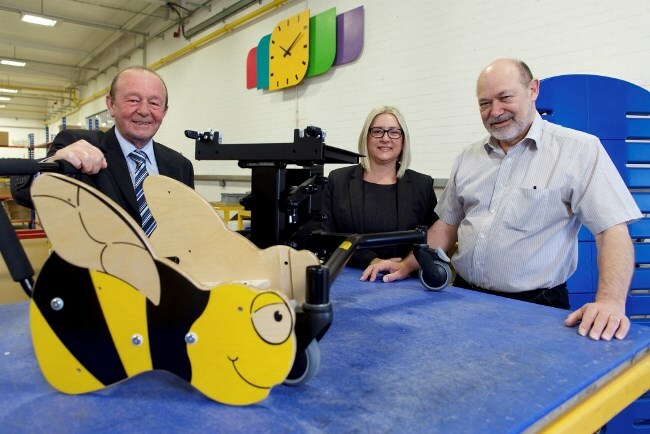 A family business that makes furniture for disabled children and adults has secured a major investment from Finance Yorkshire. Sheffield-based Jenx was founded in 1982 by product designer Clive Jenkins and his wife Catherine, a paediatric physiotherapist. The company designs and manufactures innovative support products to help children with special postural needs to live happy and fulfilling lives. Their portfolio includes products for seating, standing, sleeping and therapy. One of Jenx’s best known products is Monkey, a simple and adjustable wooden standing system for children of up to six years old. Jenx has received a Business Loan of £180,000 from Finance Yorkshire, which will help to increase the manufacturing capacity for cutting wood and plastic sheets. The equipment will enable Jenx to make products faster and with greater accuracy. To date, Finance Yorkshire has invested over £105 million in Yorkshire and Humber, enabling companies to increase their turnover by £377 million and attract a further £273 million from other private sector sources. Finance Yorkshire investment has helped those SMEs to create and safeguard more than 12,200 jobs in the region. Clive Jenkins, managing director of Jenx, said: “Our products are designed and manufactured to provide the support that children need as they develop. We work closely with children, carers and therapists .Our products are used by children in many different environments including health, social services, education and at home. Jenx has a turnover of around £6m and employs 75 staff. It currently exports around 15 per cent of its products to countries including Australia, New Zealand and the US. UK sales and distribution of Jenx products is carried out by a division of Jenx Limited called Jiraffe, run by daughter Holly Jenkins, which has grown strongly since its launch two years ago. “We have been growing over the last couple of years but there are always new product areas for us to look at. While Jiraffe is focused on the domestic market, Jenx is now pushing forward with a more global view and growing our international trade,” said Clive.